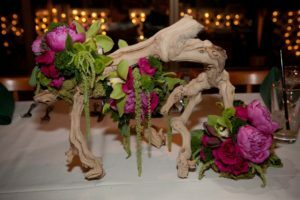 One of the most interesting decisions that we see at our events is the wedding table centerpiece. These decorations are so unique to each wedding and each culture, and each bride has her own individual idea about how she wants to bring the table to life. We’ve seen so many gorgeous centerpieces that we wanted to highlight some of our favorites from not only our events, but others we’ve seen. We’ve put together a list of six wedding table centerpiece ideas that we love. 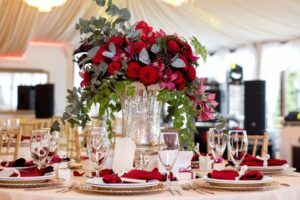 It’s important to have a beautiful presence on your table with the design you would like for your wedding table centerpiece. 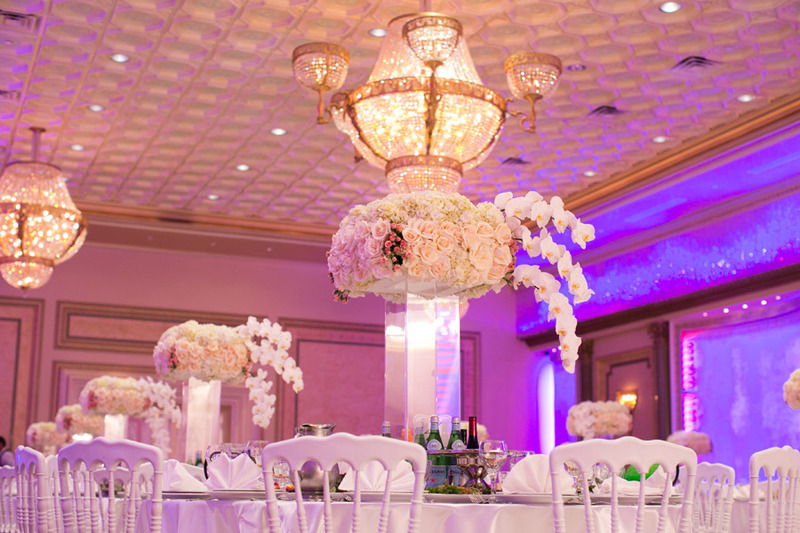 This elevated flower bouquet is one we recently had at our wedding venue that was both beautiful and creative. This elevated bouquet combined light and dark pink, red, and a little sprinkle of yellow to create this wonderful centerpiece. What we loved about this specific centerpiece is the clear vase used to elevate it. Elevating the bouquet frees up the table to give our guests a little more space. Plus, since it’s elevated, it clears visual space for when talking to other guests at your table. Here’s another one we recently had at our venue. Similar to the previous wedding table centerpiece, this one is also raised. While the other centerpiece vase is a little more modern and simplistic due to its rectangular shape, this one provides a more sleek, elegant, and traditional look. This bride elected to go with more spring colors for her wedding table centerpiece. The strong yellow and green really stand out while mixed in with the off-white flower that dominates the bouquet. The first two wedding table centerpieces are much more common than this third display. This is a unique centerpiece that just sprawls across the table and is guaranteed to have guests talking about it. This centerpiece strays away from the traditional main feature of the table. The real wood used for this piece guarantees every table will have something a little different. The gorgeous deep violet and red contrast with the natural brown look of the wood offering an eye-catching visual for guests. This specific centerpiece will draw your guests’ eyes to it. The deep, regal red pops out to give a very majestic look to your table. The contrasting flowers, and straw band color, is reminiscent of orange sorbet. This piece is absolutely delightful and minimalistic in its nature. We can guarantee that this wedding table centerpiece will fit in perfectly into a modern-style reception. This is one our favorites. The colors absolutely pop out for your table, and can be a nice contrast depending on what your table decoration arrangement is. The burnt orange, green, and brownish colors provide an element of fall that is hard to go unnoticed. 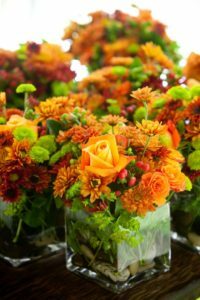 Grouping three to four of these arrangements as your wedding table centerpiece is a great option, especially since many guests take home the decoration as a souvenir, providing more guests with the opportunity to take home a memory from your wedding. This pink-and-red flower themed wedding table centerpiece gives off a Valentine’s Day vibe. What bride wouldn’t have her heart melt after seeing that? The clear and elegant vase provides some depth to the centerpiece. Though it’s not as tall as the first two centerpieces, this provides some more space for guests at the table by having the flower arrangement elevated. Pink and red are classic flower choices for any occasion. This centerpiece offers a more traditional feel compared to some of the others we’ve taken a look at. Nonetheless, this is an exquisite centerpiece. You’re going to get a variety of different styles of centerpieces when you browse for ideas. 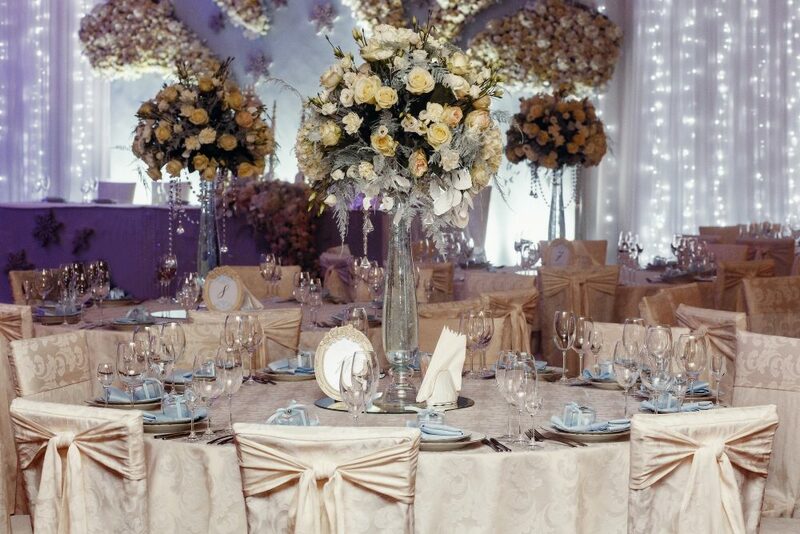 It’s important to figure out your budget that you’ve allocated for your flower arrangements and go from there. Looking around the Internet is going to give you many different ideas. Depending on the season, you’ll probably see various themes as well due to what’s in season at the moment. We’d recommend visiting various flower shops to get ideas for what you want. 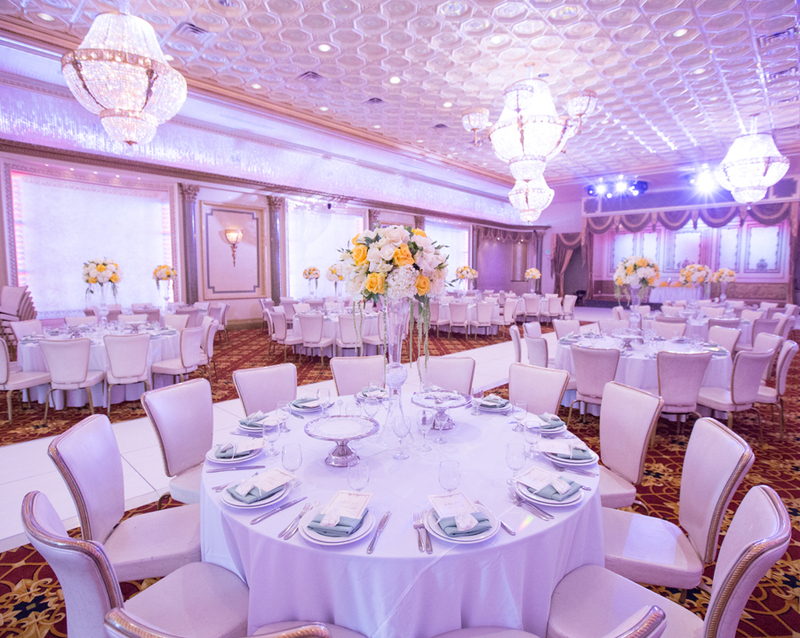 You can also check with your wedding venue to see if they have a list of vendors that they have worked with successfully.